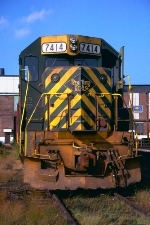 Description: D&H GP-39-2 7414 (ex-RDG 3414) waits with other sister units at the Bethlehem engine terminal in April, 1977. Description: D&H GP-39-2 7414 (ex-RDG 3414) is mixed in with a quartet of D&H units as they prepare to depart the Bethlehem engine terminal. Description: A quartet of D&H units led by GP39-2 7407 (ex-RDG 3407) prepares to leave Bethlehem in April, 1977. Description: A Westbound is stopped in Hornell to change crews. Description: A Westbound prepares to depart Oneonta. Description: D&H RW-6 powered by four EMD four axles crosses the Rockville bridge en route to Pot yard. Description: Today's "Oilcan" has 452 and 7414 for power.